Garst Museum has been selected as the “Best Historical Museum” 2015 by readers of Ohio Magazine. GREENVILLE — Darke countians have already known that Garst Museum is a valuable landmark in the community, and now all of Ohio knows it. Garst Museum has earned a top ranking in the state; the readers of Ohio Magazine have spoken and the museum has joined the ranks of their annual “Best of Ohio” 2015 publication as “The Best Historical Museum,” an honor which casts a positive light on the efforts of the dedicated Garst staff and volunteers. Johnson said he and his staff, in their celebration, plan to continue upholding the favor of their visitors by adding more opportunities to interact with many of the resources and collections held at the museum including the free Lectures Series, Outreach Education programs, the Gathering at Garst festival and the Darke County Research Center. “As the repository for the historical events and figures of this region that have had a national as well as an international impact, the Garst Museum provides each visitor with the opportunity to experience a wide range of eras from the earliest days of pioneer exploration and settlement to the local legends and heroes of the 19th through 21st centuries, including Annie Oakley, Lowell Thomas, and Bronze Star recipient Douglas Dickey to name a few,” Johnson added. Garst Museum’s six wings cover 35,000-square-feet of Ohio history. Visitors enter through the main building — a Victorian structure built as an inn in the 1800s — to find exhibits that span from the state’s early inhabitants (think mastodons) to an exploration of the connections broadcasting pioneer and Darke County native Lowell Thomas had with Lawrence of Arabia. 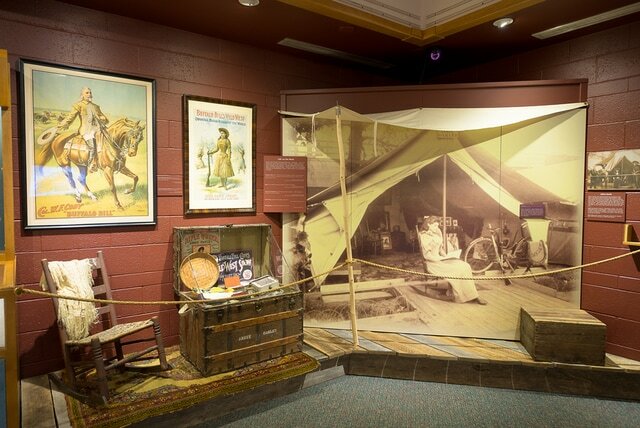 But the Garst Museum is also the home of the National Annie Oakley Center, dedicated to clearing up some of the inaccurate portrayals of the Ohio-born marksmanship superstar. Viewers walk through a timeline of artifacts that span Oakley’s life, including several of her rifles at the museum, located at 205 N. Broadway, Greenville. The celebration at Garst will continue throughout 2015 and the public can be a part of it. The Garst Museum is open Tuesday through Saturday from 10 a.m. – 4 p.m. and Sundays from 1 – 4 p.m. Admission is $8 for adults, $7 for seniors (60+), $5 for youth (6-17), and free for children 5 and under and free for all museum members. For more information about the Garst Museum visit www.garstmuseum.org or visit the facility.